Like soft and sweet pink marshmallows, this pink rose bouquet will be a sweet treat for your beloved. This hand tied bouquet of pink roses in cello is available in bunches of 12, 24, 36 or 48. Picture shown with 48 roses. A variety of mixed seasonal dark and light pink flowers with a touch of green in a hand tied bouquet is the perfect floral gift for any occasion. A distinctive flower for that someone special... a bouquet of 10 or 20 mixed coloured tulips presented in a glass vase. Delivery in Durban, South Africa. Tulips are delivered in bud. 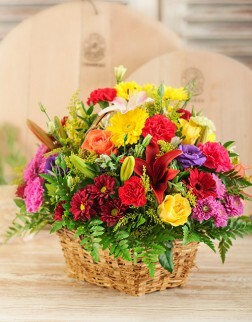 This striking basket of bright seasonal country flowers is sure to turn the most sombre occasion into a joyous one! This vibrant assorted hand tied bouquet of lilies will be greatly appreciated on any occasion. N.B. The lilies might arrive in bud, but they are meant to be this way as it means they are fresh. Colours may vary. Eat, Pray, enjoy life and spread love all around you with this bouquet of lilies, roses and gerberas, nestled in greenery. Mixed pink and white flower basket arrangement of roses, gerberas, daisies, and greenery. Great for any occasion, especially as a Birthday, Get Well Soon or Mothers Day gift. Baskets may vary. Picture shows Large Size. Delivery in Durban and surrounding areas.